I got a TON done these last two weeks despite being on vacation for one of them, which was incredible. I finished up the player sign-in screen functionality which is a huge step forward. All of the face button functionality is in, tested, and working. “X” brings up the player label input overlay which players can navigate using the D-Pad. As mentioned in my last PPJ, I couldn’t use the Unity event handlers, so I had to custom code the menu navigation on top of the custom input handling. “Y” brings up the controls overlay. For now, players can choose what actions are assigned to each bumper, but more control customization will come once some design decisions are made. The “B” button changes your team, and holding “B” brings up the title menu again. Pressing “B” while the label input is up acts as a backspace. 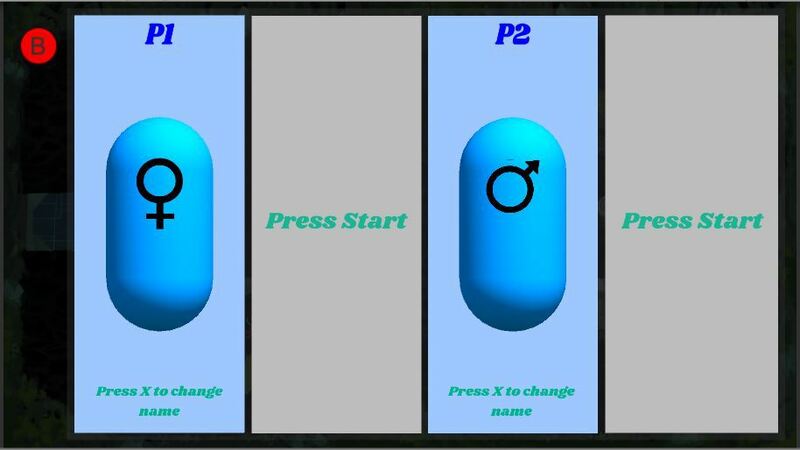 The “A” button changes which model you will use (male/female) which is, for now, just reflected with a simple UI element. In the future fully animated character models will replace these placeholders and update as players make their selections. Pressing start then locks you in and signals that you are ready for the game. Once all four players are locked in, a timer will start. During this timer, players can press start again to back out and continue making selections, but once the timer hits zero the game will begin. All of the selections made here are now saved into a static script that persists into the game scene. This means that all of the label, gender/team, and controls choices made here now actually take effect in-game. I also created input management for OSX so mac users can test and play as well. This was a strange challenge since the D-pad is treated differently between windows and mac. On windows, the d-pad is treated as an axis from -1 to 1 horizontally and vertically, same as the joysticks. On mac, however, they are treated as buttons, just true or false. That’s about all I got done since my last PPJ since I was out of the country for a week. Next, I need to prototype the in-game UI elements, but that’ll have to wait until all of the code is re-structured. My attention is beginning to shift toward setting up the animation systems for the characters as that will be my next big project. I’m super pumped for the upcoming term.